I thought you all might enjoy some photos from Global Big Day 2018. If you don’t know, the goal of any “big day” is to see as many species of birds in a single day as you can. With that in mind, as well as a few rare targets species to find, Camille and I visited several locations on Merritt Island National Wildlife Refuge (Brevard County) and then made our way to Joe Overstreet Road and Landing (Osceola County), totaling about 80 species for the day. One of the *wetter* areas along Blackpoint Wildlife Drive. Some areas were all dried and cracked. 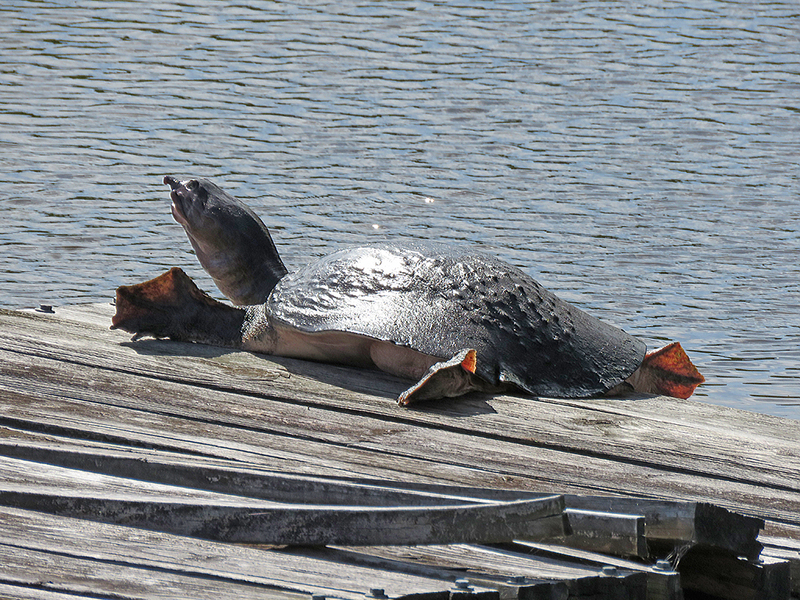 Florida Softshell Turtle at the MINWR visitors’ center. 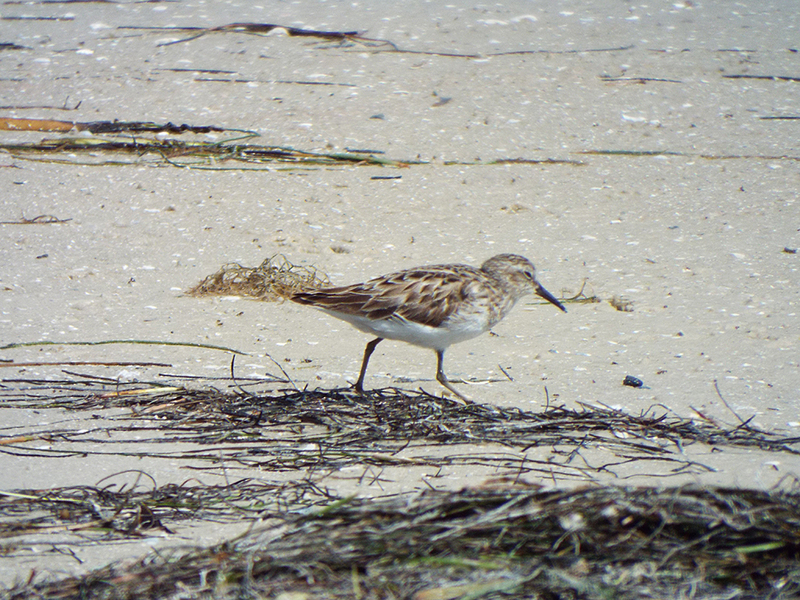 A Least Sandpiper checking out the camera operator! 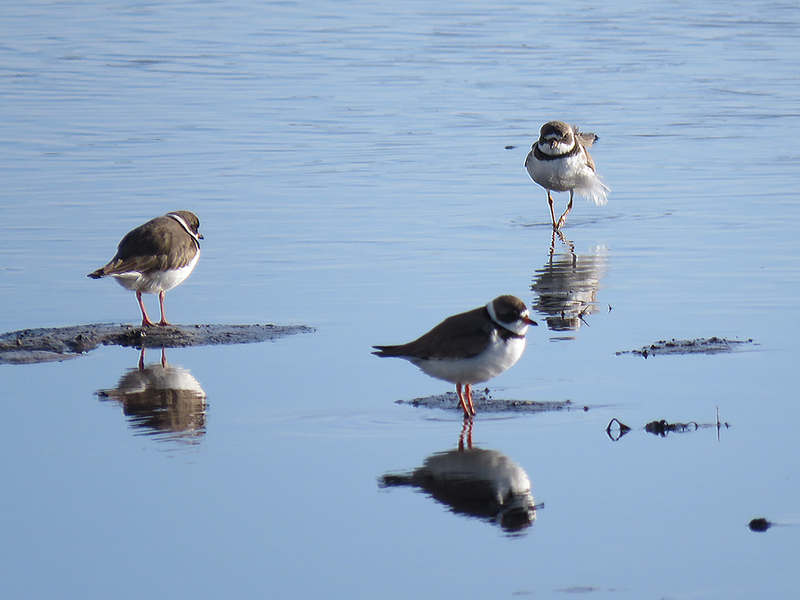 You can never have too many Semipalmated Plovers, right? 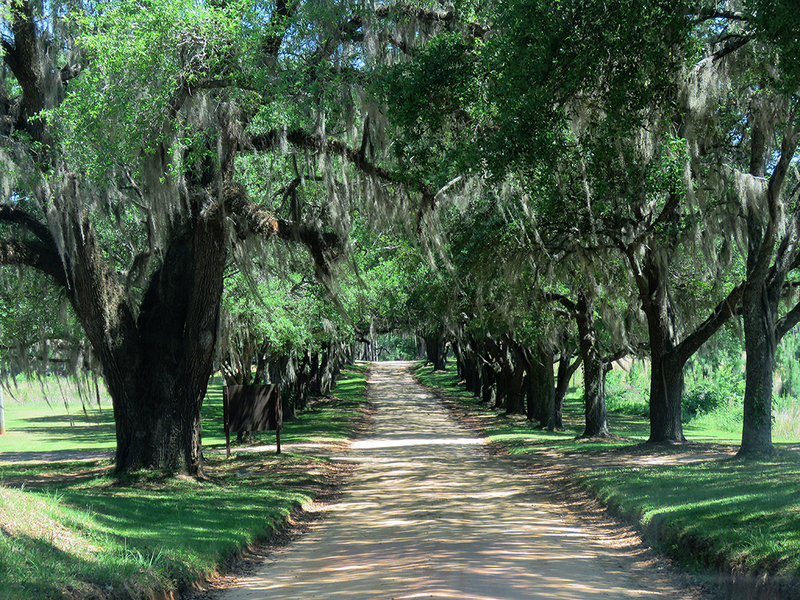 After lunch, we made our way into Osceola County and Joe Overstreet Road and Landing. The sod fields seemed mostly empty of shorebirds, but both sides of the road were ringing with Eastern Meadowlark songs. 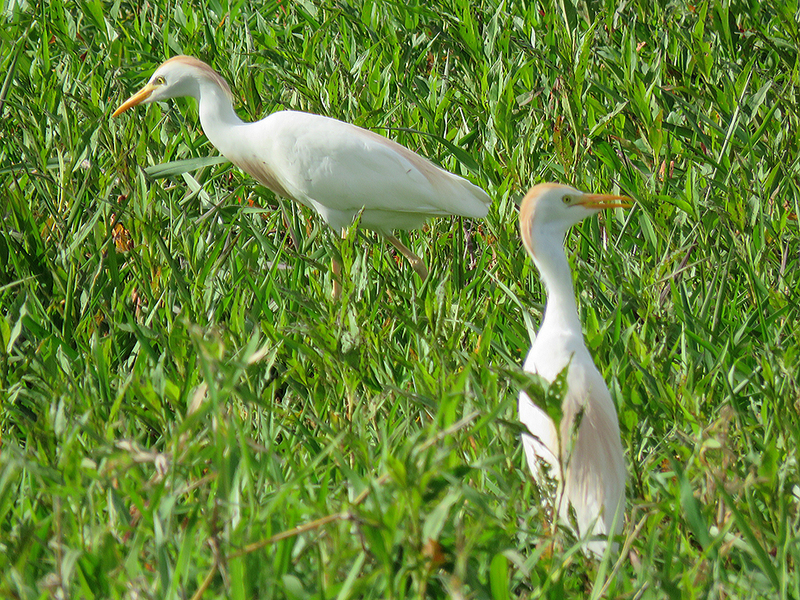 Down at the lake, we had a surprise Pectoral Sandpiper, a good look at a snail kite, and a Yellow-billed Cuckoo that gave us a bit of a chase around the picnic area. 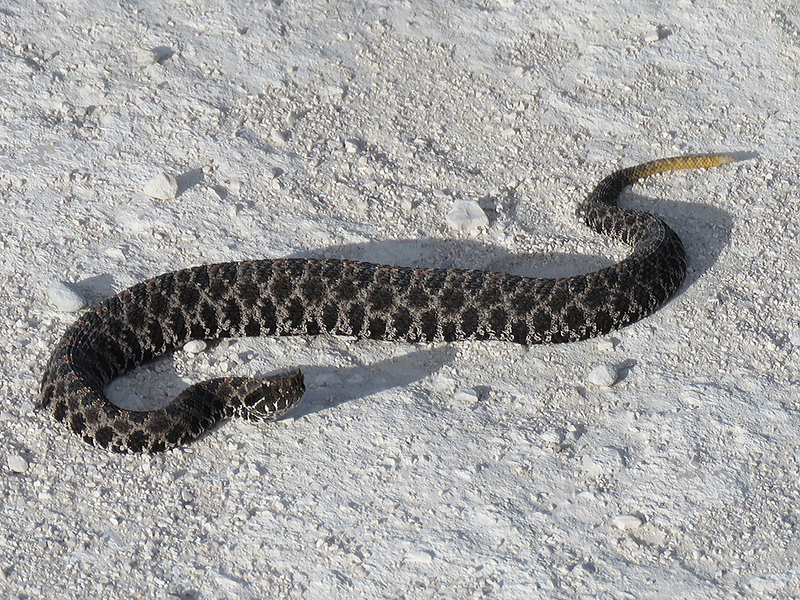 On the way out, we stopped to see a Pygmy Rattlesnake that had to be coaxed off the road by another wildlife watcher. Pygmy Rattlesnakes are the smallest species of rattlesnake, as their name suggests. This adult was barely 30cm (1 foot) long! 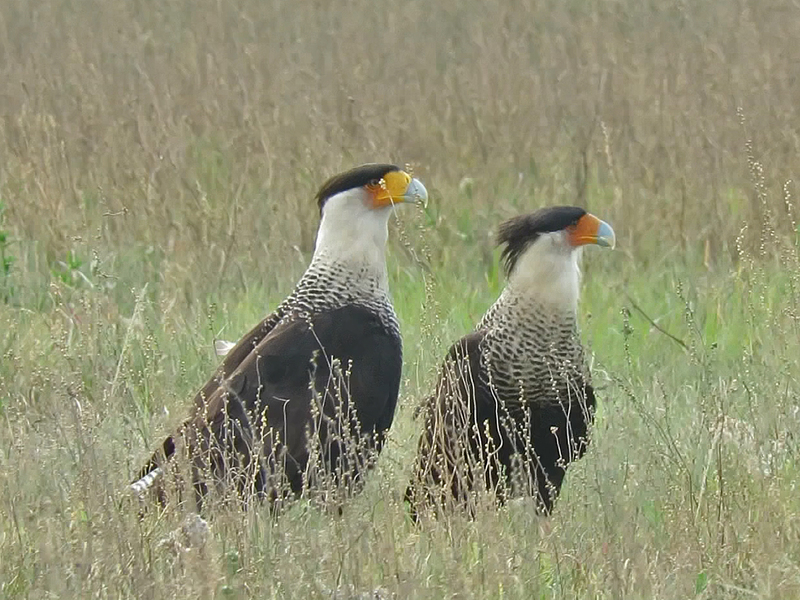 A Crested Caracara family. Mom, Dad, and 3 chicks. That was the extent of our Big Day, which was tiring but rewarding. Even “missing” the hoped for birds at the start of the day, there wasn’t much to complain about, with great weather and good birds for all. “Old growth forest” is a term that for many of us, especially those from the northeastern USA, conjures up images of impassable, dark tangles and massive roots waiting to trip up anyone foolish enough to enter. Something straight out of Tolkien’s Fangorn Forest or the Fire Swamp from The Princess Bride. But that kind of forest exists mostly in our imagination. Real old growth forests are more ordered and open than you might imagine, and almost every forest has been managed to some extent by humans since there have been humans. 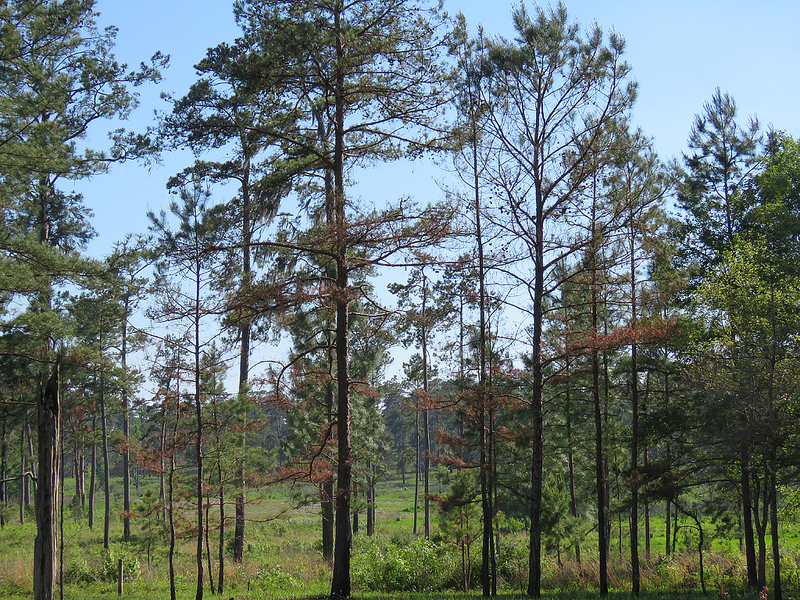 In the southeastern US, fire has historically (and prehistorically) played the primary role in managing the landscape, and an old growth forest is much different than you might imagine. The forest at dawn, with a mature ground cover and light filtering through centuries old trees. This would have been a common sight from the Carolinas through Mississippi before European colonization. When the so-called pioneers first started moving through the vast pine forests of the southeastern US, they commented on the openness of the forests and how it was relatively easy to transport their carriages and carts through the forest. The way trees compete for resources, such as sunlight and water, combined with regular burning, results in a landscape such as you see in these photos. 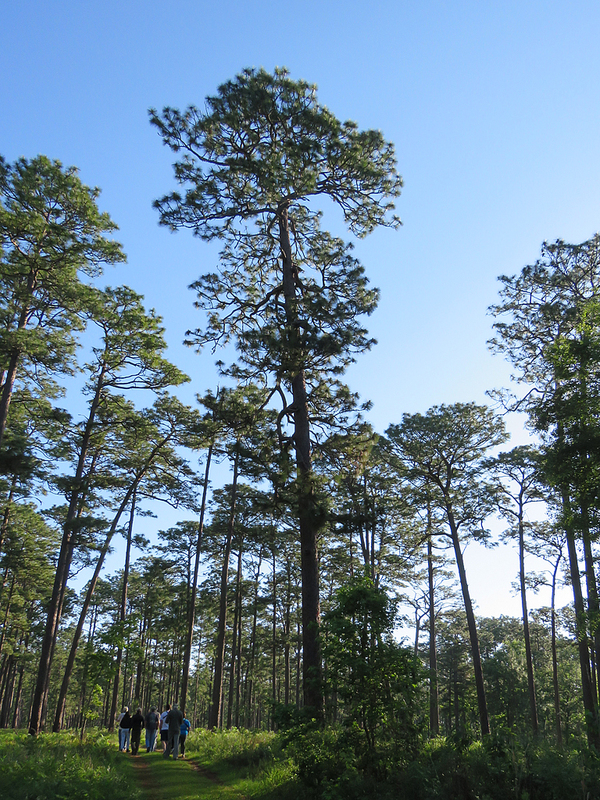 The trees in this forest may look young, but 120 year old Longleaf Pines are sometimes only 18 inches in diameter. Unfortunately, nearly all the old growth forests in the US are gone, reduced to parcels like the Wade Tract, in southern Georgia (managed by Tall Timbers Research Station) [map]. 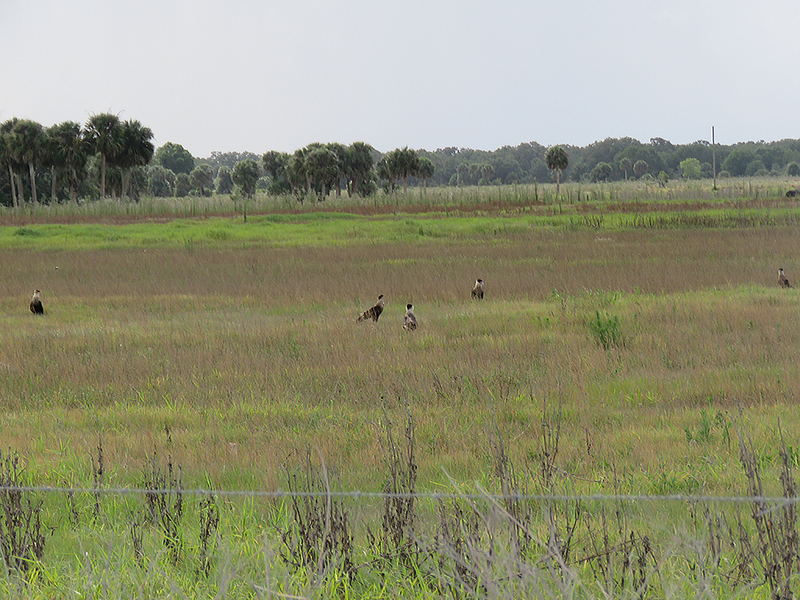 I was fortunate enough to visit this landscape the day after the Florida Ornithological Society’s Spring meeting. 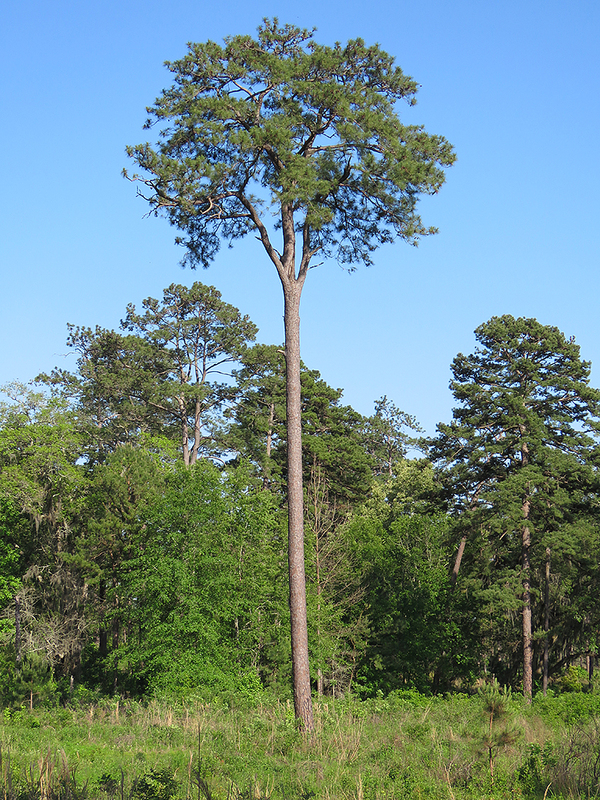 A 400 year old Longleaf Pine towers over some of the FOS members. Of course, being an old growth forest isn’t about dense growth or tall growth. It’s about being old. This has serious implications for plant and animal communities that normally exist in various symbiotic and complementary relationships. It also extends into the soil and the microbial and chemical processes that go on there. 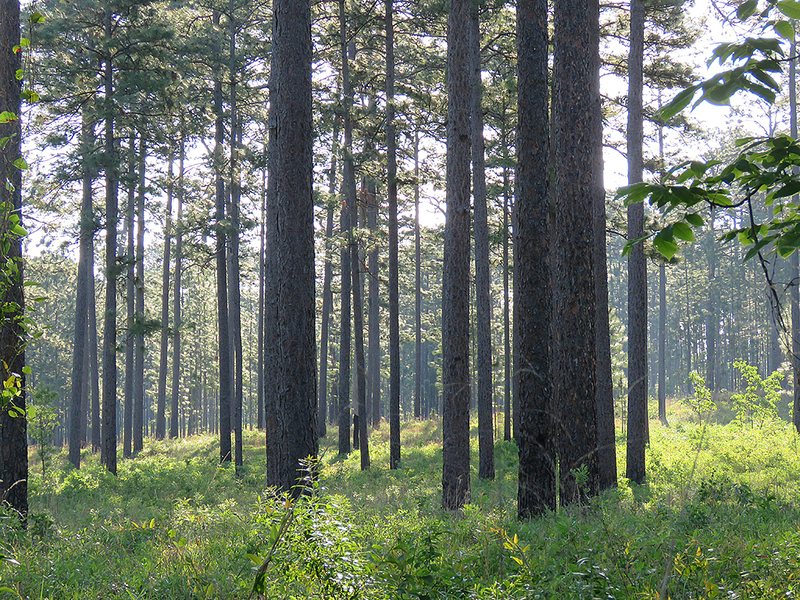 If you want to learn more about old growth forests, and southern pine forests in particular, visit the Tall Timbers website or have a look around the internet. 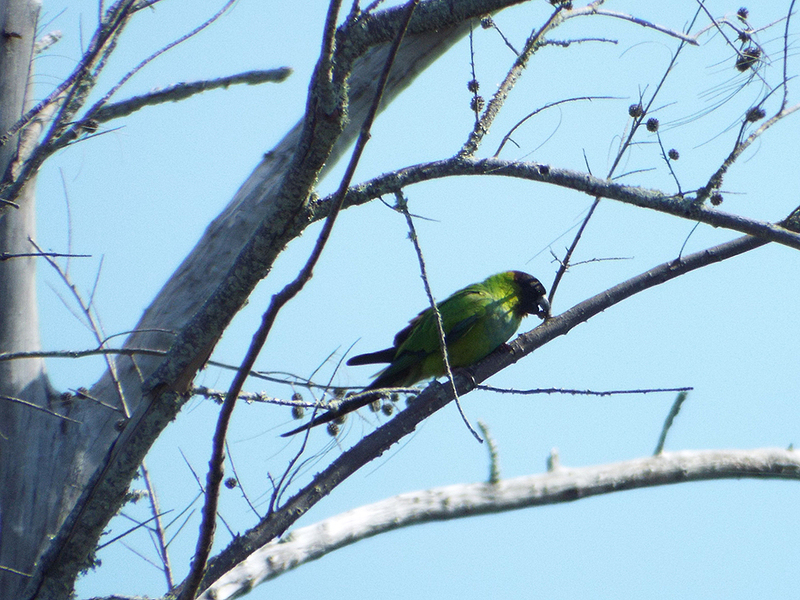 As far as birdwatching, the Wade Tract was full of birdsong and surprises. For one thing, there were no migrant birds sighted on the property. 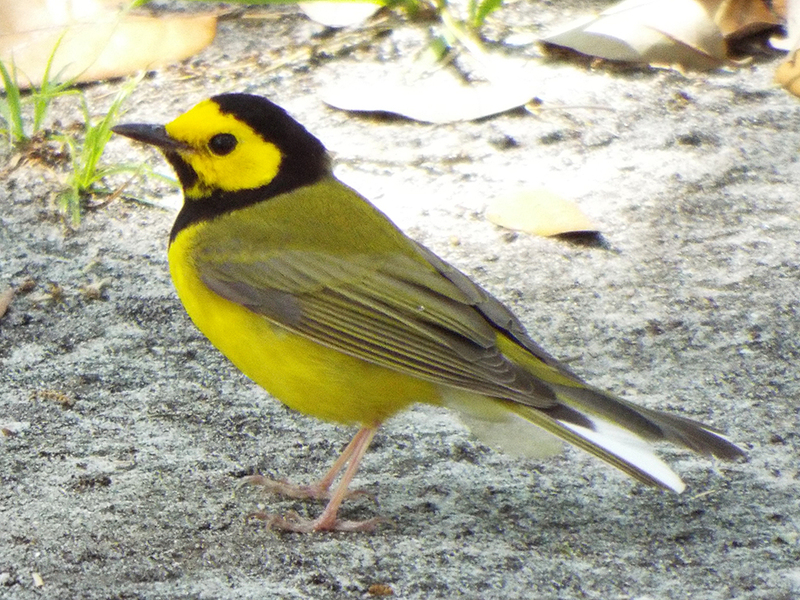 While late April is normally past the peak for songbird migration in Florida, I had expected at least some warblers or thrushes to still be making their way through the panhandle. Despite this, there were plenty of resident birds around. 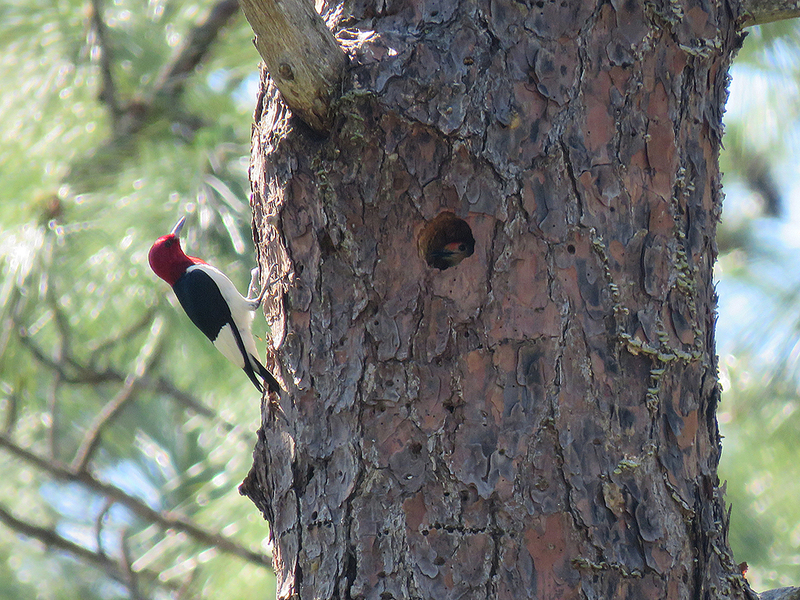 I’ve never seen so many Red-headed Woodpeckers in one place. With plenty of snags (environmental jargon for “dead tree”), several species of woodpecker and other cavity nesters were prevalent. With so many trees of various sizes, you’d think there’d be no cause for squabbles for nest sites, but birds are nothing if not competitive. I saw a Red-headed Woodpecker chase a Red-bellied Woodpecker from a tree. They bickered and fluttered at each other and then the Red-bellied quickly flew into a nest hole. 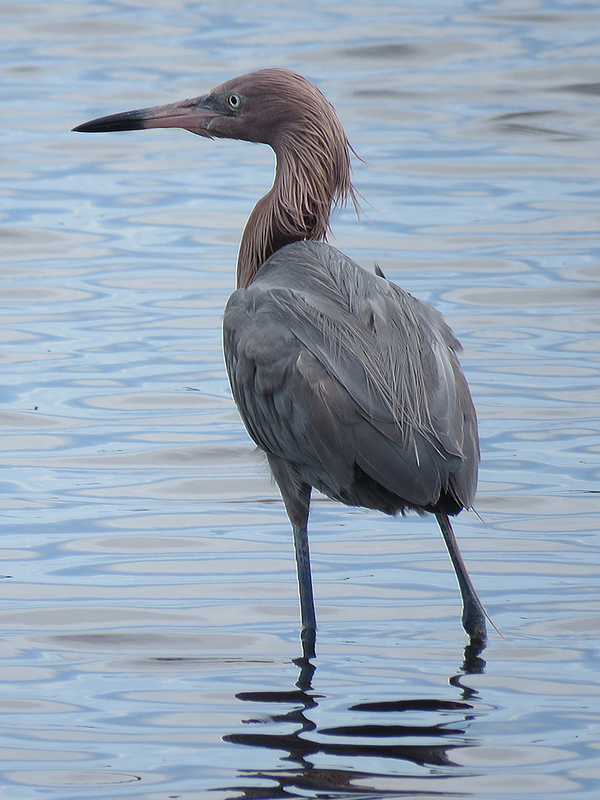 The Red-headed watched, perturbed, for a couple of minutes, making little annoyed calls, and eventually flew away. The Red-bellied stayed holed up for the remainder of our time by this tree and poked his head out every once in a while! 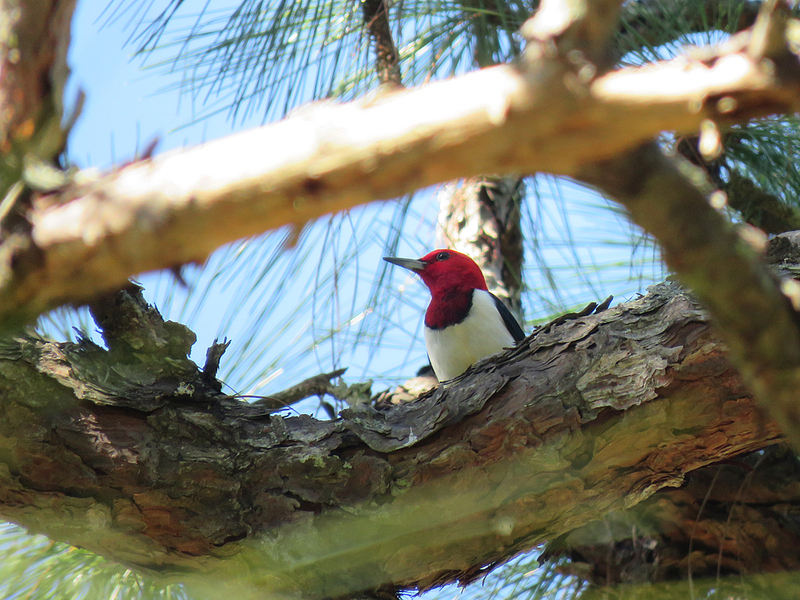 A male Red-bellied Woodpecker peeking out at a Red-headed Woodpecker that chased him from a perch just moments before. The understory of the forest is open enough to provide suitable habitat for some birds that we more commonly associate with scrub and edge habitats, like Eastern Towhees and Blue Grosbeaks. 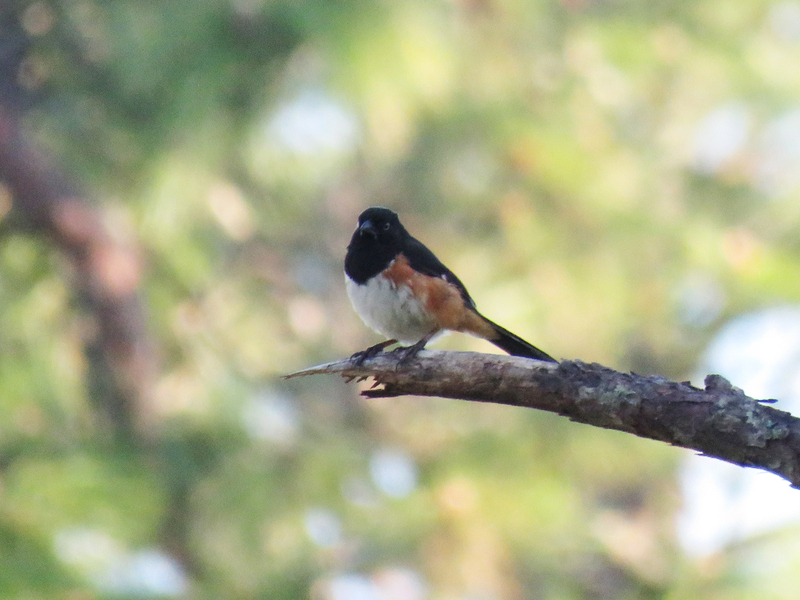 A male Eastern Towhee watched us go by while a female (probably his mate) foraged in the ground cover, below. The frequent burning keeps the palmettos at bay, encouraging native wire grasses that Bachman’s Sparrows favor. Other birds that could be seen and heard throughout the tract were Indigo Buntings, Eastern Wood-pewees, Pine Warblers, and even some Red-cockaded Woodpeckers. In fact, I saw my first natural Red-cockaded Woodpecker nest holes. 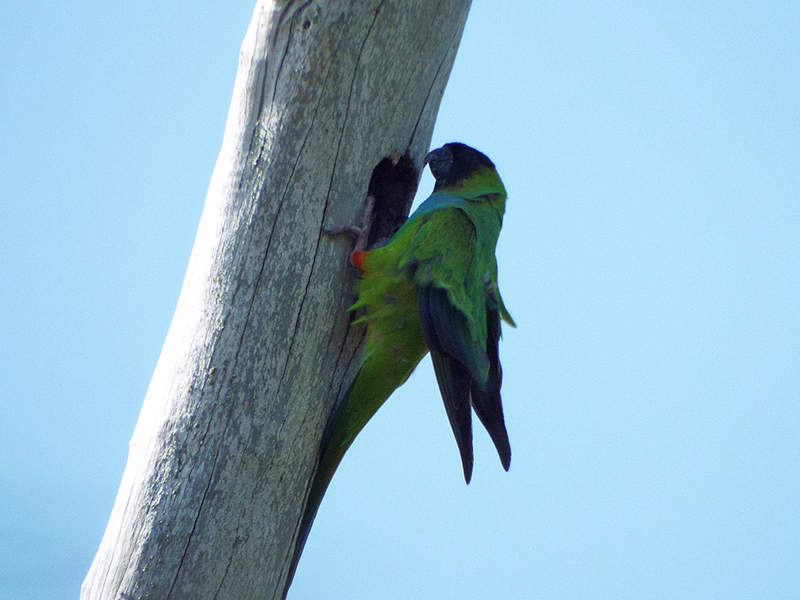 Other nesting areas for this bird use artificial nest boxes to compensate for the lack of old trees with heartwood fungal decay these birds otherwise require. A naturally excavated Red-cockaded Woodpecker nest. Note the sap running around the hole and that the birds use to help protect their homes from predators. After making our way through some more amazing forest vistas, we made our way back to Tall Timbers Research Station and said our goodbyes. It’s been hard to convey the awe-inspiring beauty of these spaces and what they have meant throughout history, so I hope you’ll take the time to find more information. 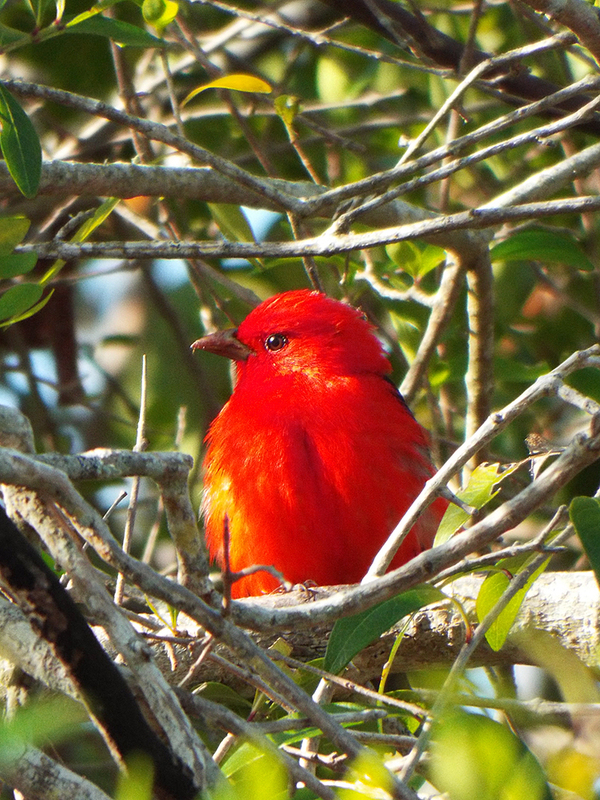 Last weekend was the Spring meeting of the Florida Ornithological Society. The was our first “light” meeting; previously, we had two large meetings per year, each with scientific paper presentations, keynote speakers – the works. Starting this year, we decided to have one large meeting in the Fall and a smaller Board and buisiness oriented meeting in the Spring. We met at Tall Timbers research station, just north of Tallahassee [map]. 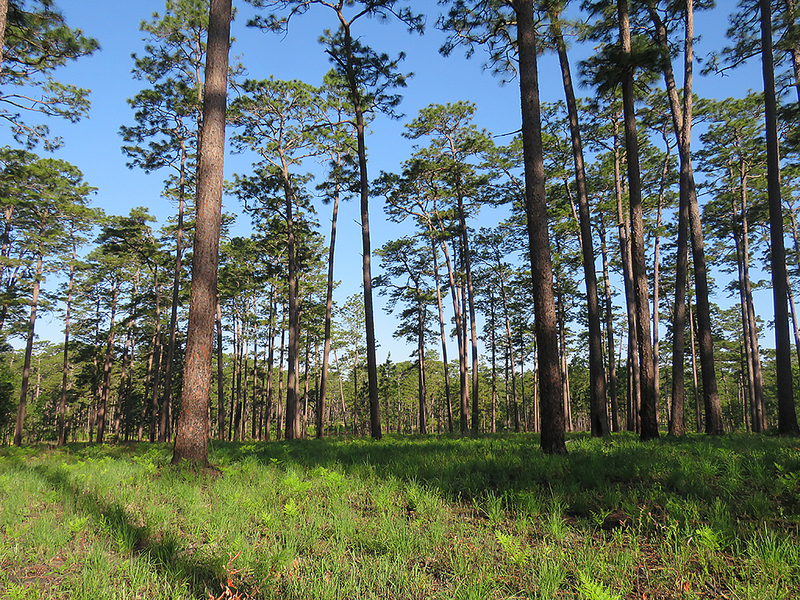 Tall Timbers is a center for the study of fire ecology – essential to the health of many southeast US ecosystems, including pine flatwoods and scrub communities – and forestry. With several plots or tracts under management, Tall Timbers is a key resource for conservation and environmentally sound land use practices. Some of the plots at Tall Timbers are burned annually. The result is a healthy, evenly spaced pine forest with an understory of wiregrass and other ground cover. Whether due to this or the comparatively northern latitude, there are almost no palmettos or other palms. The real Florida. The lodge grounds, where the meeting was held, has a good diversity of bird life, including Purple Martin families, many singing Indigo Buntings and Blue Grosbeaks in the adjacent forests, House Finches and Brown Thrashers that hunt on the broad, open lawn between buildings. I’ve never seen thrashers so exposed. Dave Goodwin jokes and calls them “Lawn Thrashers”. 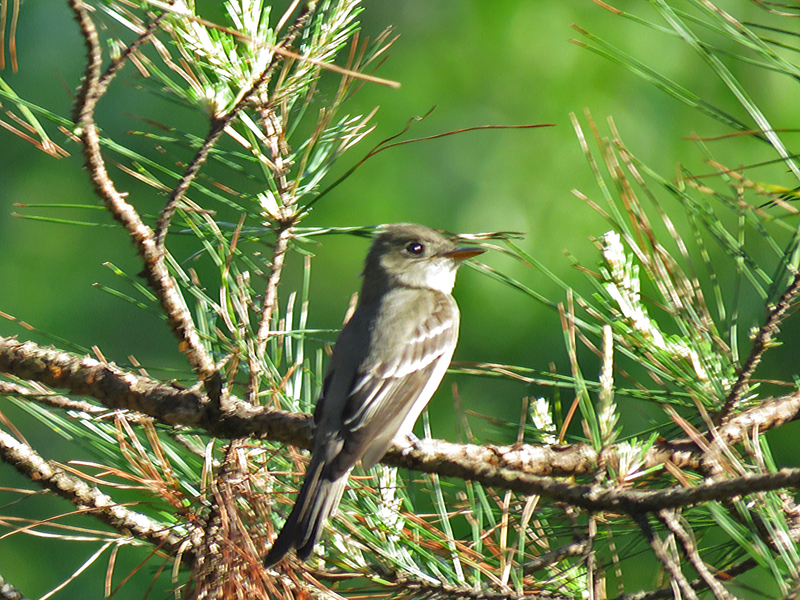 The woods were full of birdsong, with numerous Indigo Buntings, Blue Grosbeaks, Red-headed Woodpeckers, Eastern Wood-pewees, Brown-headed Nuthatches, Pine Warblers, Eastern Towhees, Bachman’s Sparrows, and more. I’m thankful to have developed a good ability to bird by ear, as sometimes this is the best look you get at a bird. This male Bachman’s Sparrow was singing, so I knew where to look for him, and together with what field marks I could see, I was able to identify him. I was surprised by two things on this trip. One, there were no almost no migrant species on this trip. Late April is near the tail-end of migration, but I expected at least some warblers to be making their way through the forest. I don’t know if it was a combination of the lateness of the season and the weather, or if these woodlands don’t support the kinds of food migrants would be looking for, but almost all the birds we saw on both days were residents. Taking photos from a moving trailer is always challenging, but here’s a nice look at one of many Eastern Wood-pewees we encountered over the weekend. The other surprise was the paucity of raptors. We saw no falcons or accipiters, and only a few glimpses of any buteos (one Red-shouldered Hawk that I did not see, and a Red-tailed Hawk that made a brief appearance). 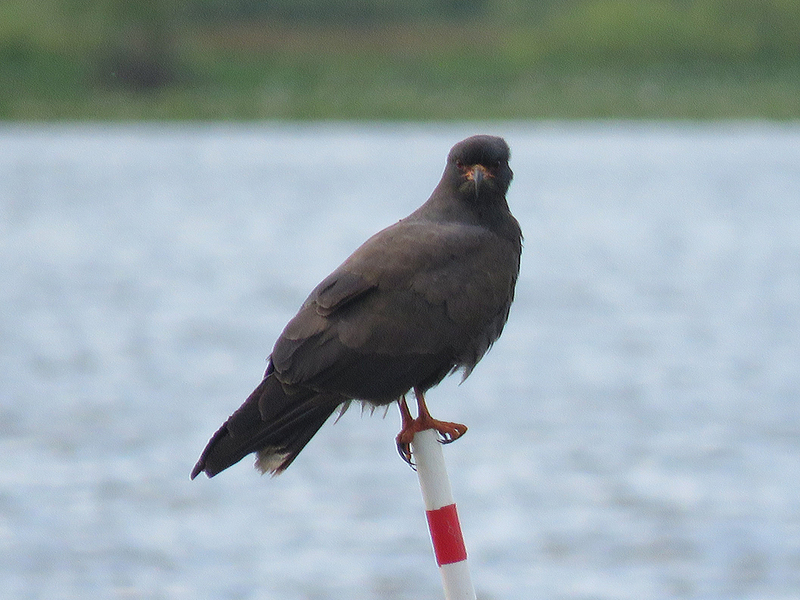 We also had a distant look at a lone Mississippi Kite. 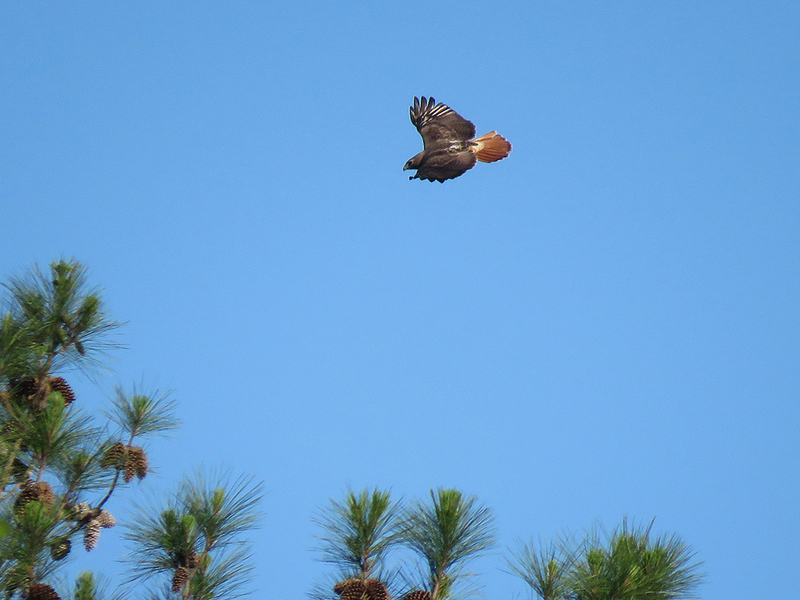 Red-tailed Hawks prefer to hunt in open country, so it wasn’t surprising to see only one. The highlight of the field trip was watching Jim Cox band some Brown-headed Nuthatch chicks. Bird banding helps scientists keep track of population trends and the health of individual birds and has a long history in ornithology. 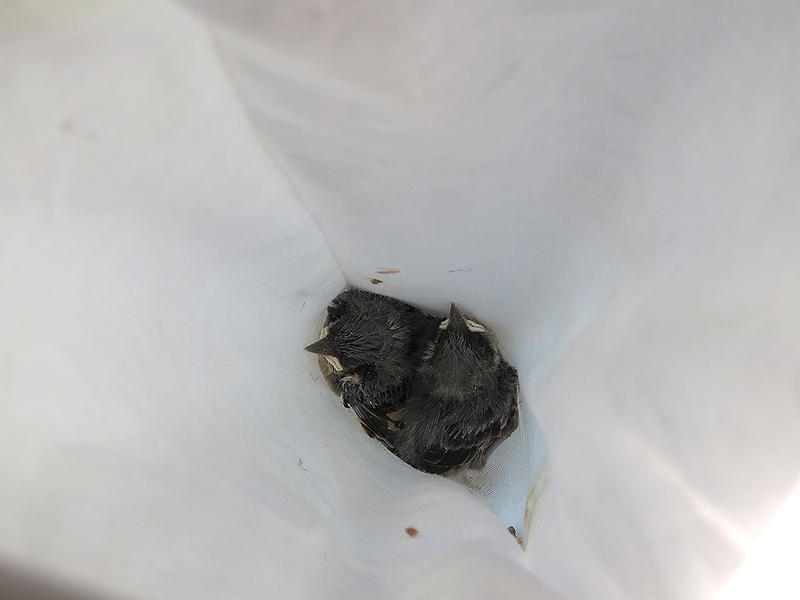 Bundles of fluffy cuteness, these Brown-headed Nuthatch chicks are about to do their part for science! The day wound down with some good looks at White-breasted Nuthatches – a Florida first bird for me – and a few Carolina Chickadees in the mix. Then it was time to head back to the lodge for our dinner and to get rest for the morning field trip to an old growth forest just over the Florida-Georgia line. Here are the eBird lists for Tall Timbers Research Station. Along with the almost, but not quite entirely indefatigable Camille, I spent the day with Sarah and Bella Muro at the park, and one epic drive home. 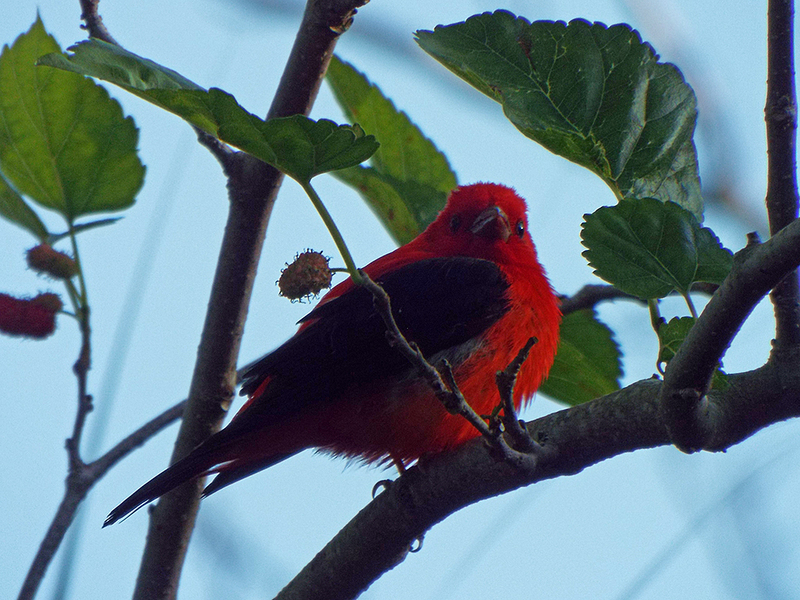 In addition to our first Scarlet Tanagers in the Mulberry Tree Area (or “MTA”), we had a nice flock of Indigo Buntings, an Orchard Oriole or two, quite a few Gray Catbirds, and even a male Ruby-throated Hummingbird. I love that hummingbirds are so small that they can use a leaf edge as a perch. 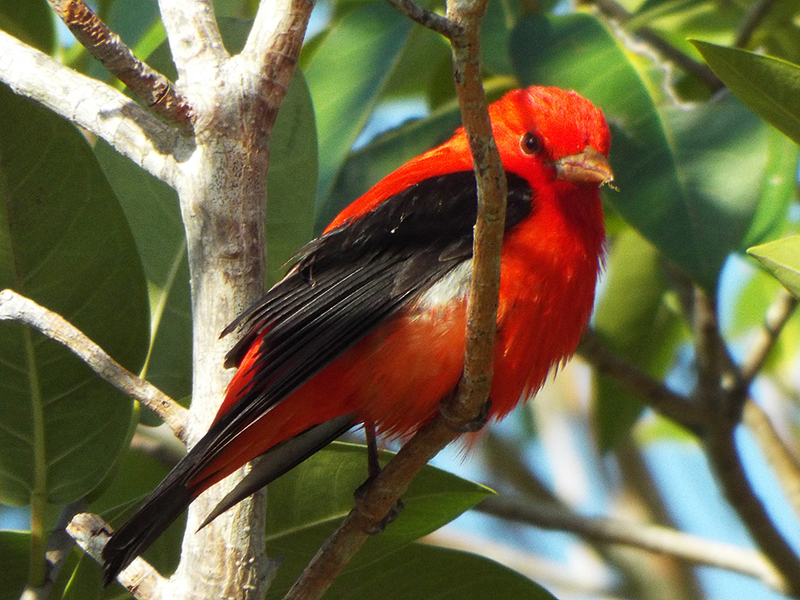 The surprise of the day was seeing at least two Western Tanagers, a male and female. We may have seen and third later on in our hiking around, but it could have been the female we saw with our first group of birds when we arrived. 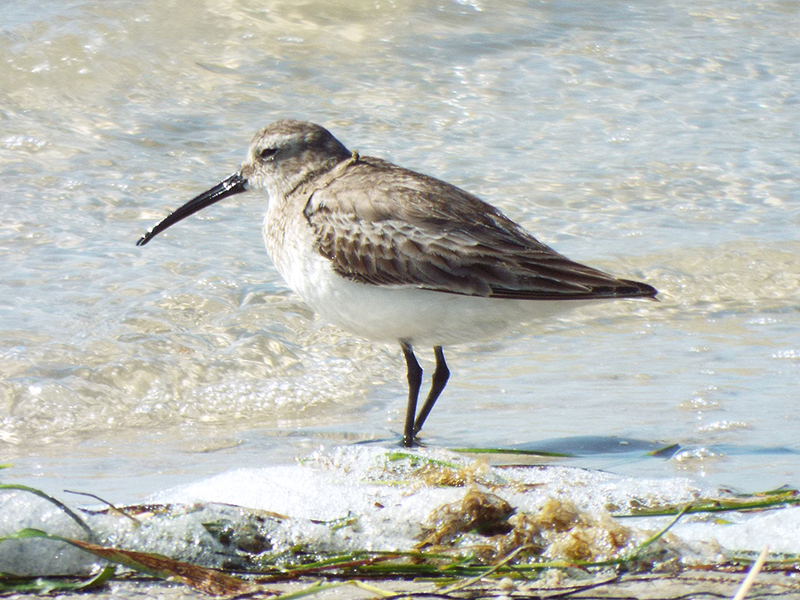 At the East Beach turnaround, we had a small collection of shorebirds, including Short-billed Dowitchers, Dunlins, Least Sandpipers, Black-bellied Plovers, and Sanderlings. Dunlin. 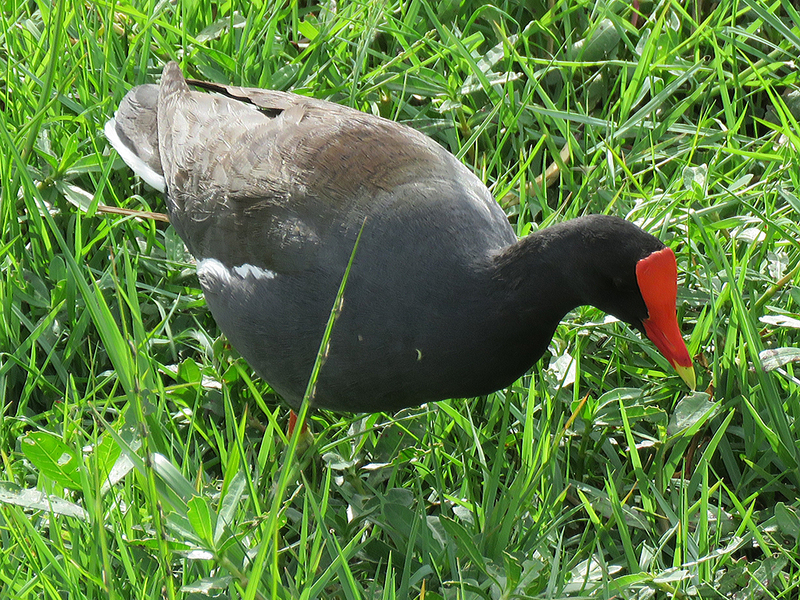 Note the distinctive decurved bill. A Male Hooded Warbler with his characteristic hood and white tail feathers. 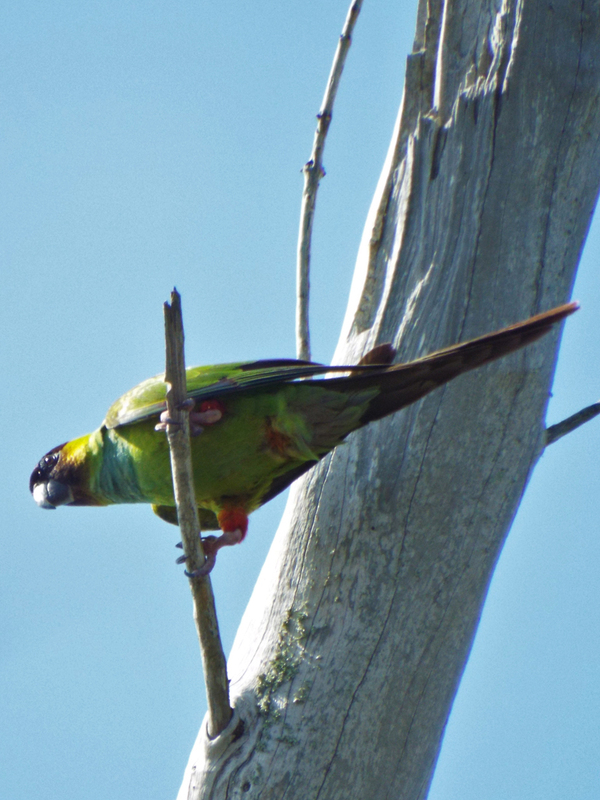 There seemed to be more Nanday Parakeets around the park than I recall the last time I was there, and they were making quite a ruckus. We had a few more various species through the park, but did not manage to find any Great Horned Owls or many raptor species at all. The final action of the day came with our epic ride home. We took a slight detour to drop of a jumping spider that had stowed away in the front seat. To get back on our route home, we ended up on Gandy Bridge. Ultimately, this slight delay and change in route wound up getting us jammed in rush hour traffic out of both Tampa and Orlando. Combined with an implausible string of accidents along our route, and our trip home took nearly 5 hours! But looking out over the water as traffic crawled along Gandy Bridge, we saw some unexpected flocks of Lesser Scaups, a few Common Loons, and even a Red-breasted Merganser. While not the rarest birds to find in April near Tampa, most of these birds would normally be well on their way north by this time. But winter has been slow to let go in parts of the Midwest and Northeast, so perhaps these birds knew to be a little patient. Here are our eBird list of the day, staring out as we approached Ft. De Soto Park and including places along our ride home. All of us got at least some life or Florida birds for our personal lists, but Bella and Sarah really got some good birds for their life lists – Bella with 6 and Sarah 7! Like most day trips out to Tampa from here, it was a long and tiring day, but Ft. De Soto is a true gem of a park, and I give a lot of credit and gratitude to Pinellas County for keeping it running so well with so many competeing uses (beach, cycling, birding, fishing, etc.). In fact, all the Pinellas County Parks are pretty well run and maintained, and you can’t go too wrong visiting any of them. It’s past the middle of April, and that means MIGRATION for us here in Lonely Birder Central. Waves of migrants have made their way north, despite the wintry weather holding on for a good part of the USA. At the start of April, Camille and I took a car trip to Stormwater Treatment Area 5/6 (STA 5/6) in Hendry County. Neither of us had birded that area of Florida yet, and it seemed a good idea to get over there before the really hot weather sets in. 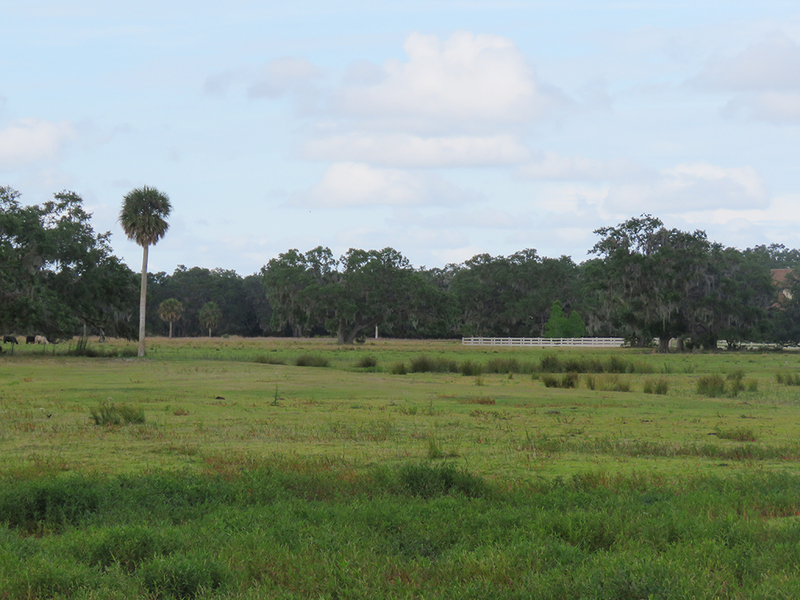 STA 5/6 is quite reminiscent of the North Shore Restoration Area and the Wildlife Drive at Lake Apopka. 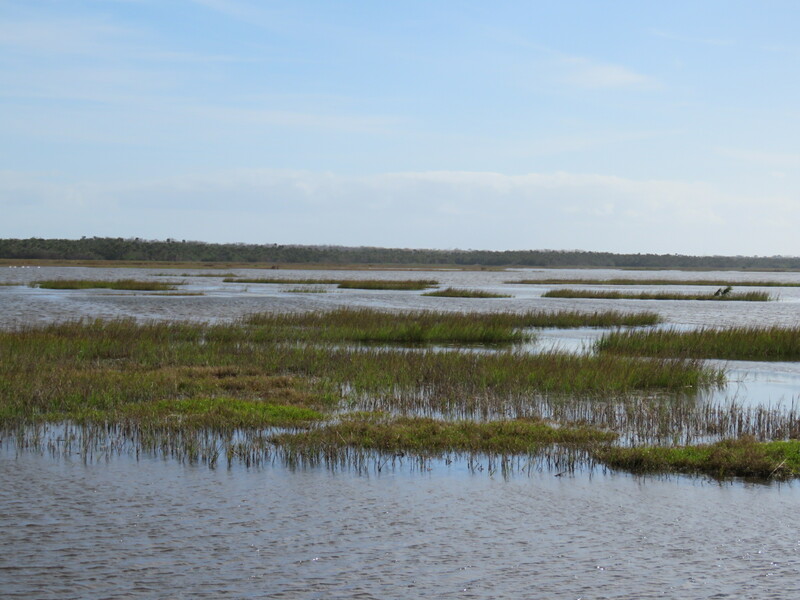 There are large cells of open or semi-open water with vegetated levees and berms, providing diverse habitats. 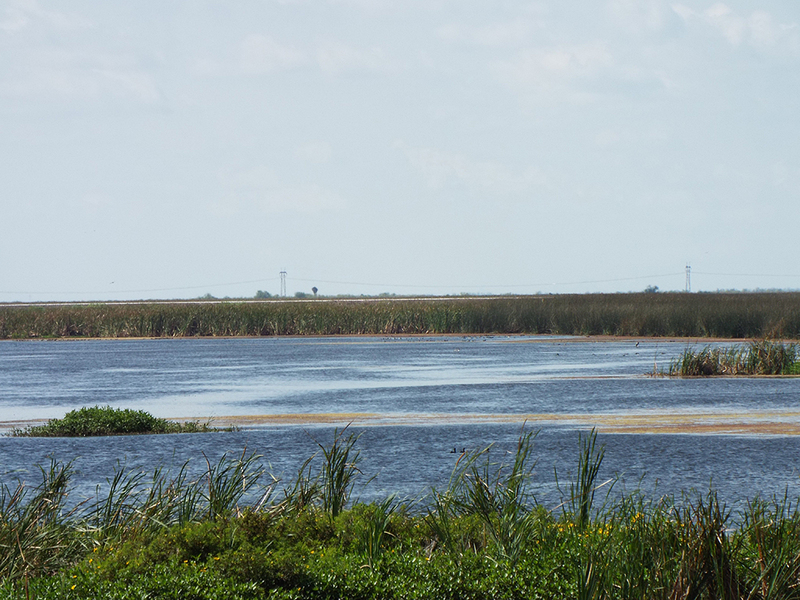 Stormwater runoff passes through various “STA”s on the way into the Everglades and adjacent hydrological systems. Various water and wading birds ruled the day, although several dozen Northern Rough-winged Swallows was a nice surprise. In addition to the expected Black-bellied and Fulvous Whistling-Ducks, there were some “hangers on” Northern Shovelers and Blue-winged Teals. 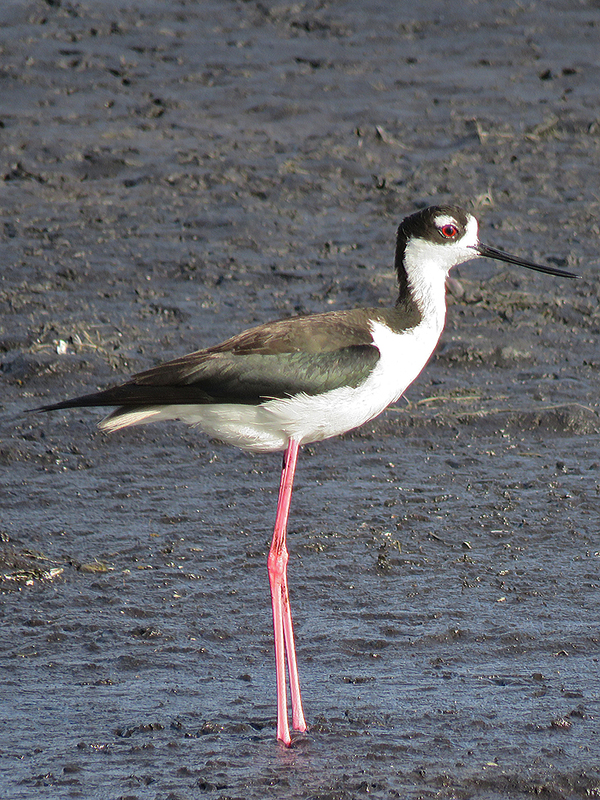 Black-necked Stilts seemed poised for nesting, and other shorebirds were making good use of the muddy edges to the treatment cells. 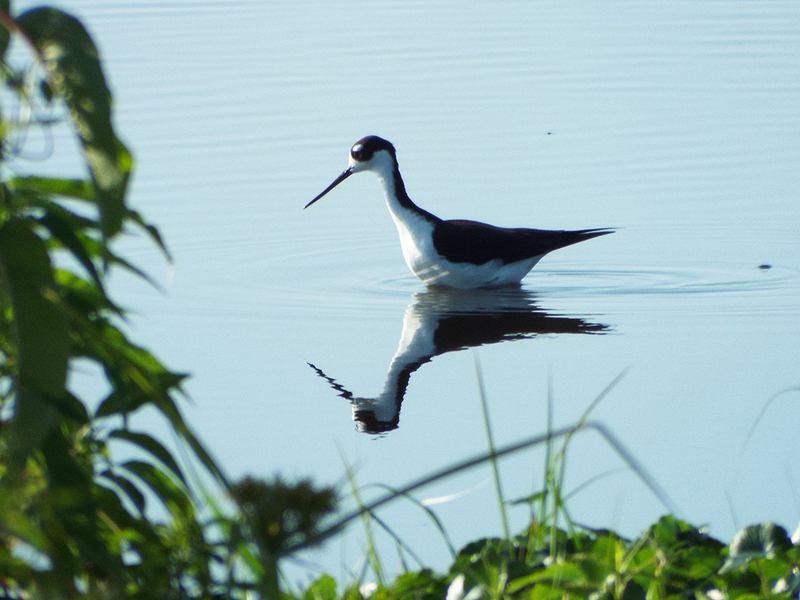 Black-necked Stilts can forage in deeper water than other shorebirds and waders of similar body size due to their long legs (submerged in this photo). 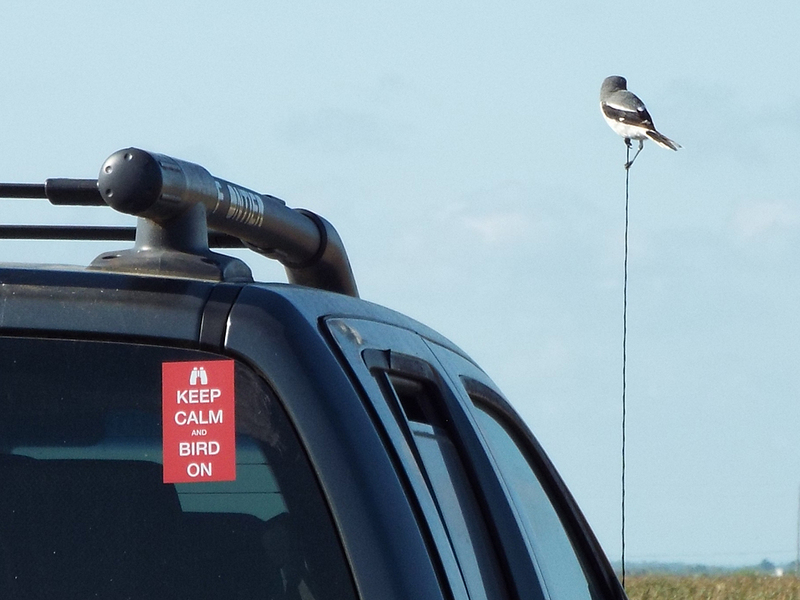 A bold Loggerhead Shrike took a liking to Ken Spilios’ vehicle! I don’t think that’s what “Bird On” means, does it? 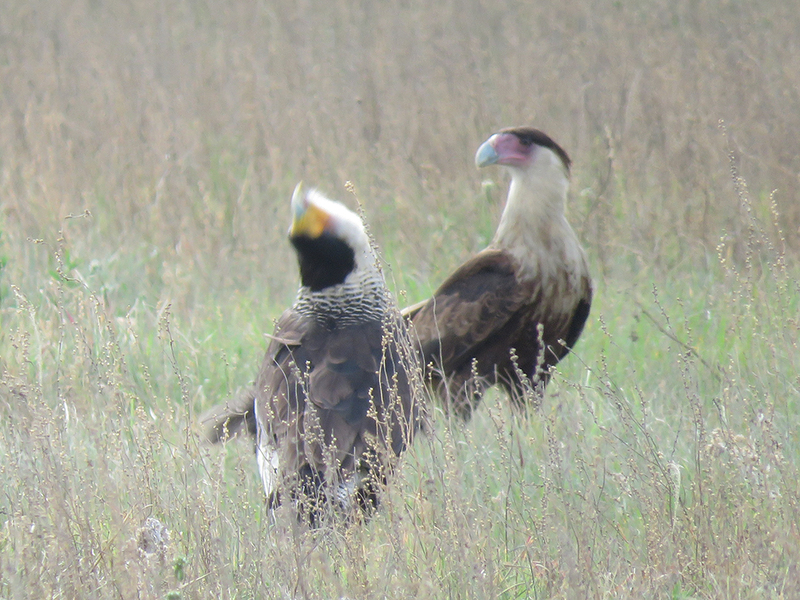 We also got a nice look at a Crested Caracara, which let us loiter around its chosen post for quite some time. It’s likely it was serving as a lookout for a mate somewhere in the vicinity. While we watched it, we saw Peregrine Falcons and Snail Kites nearby, too. The Crested Caracara has such presence, it is easy to see why it is the national bird of Mexico (though arguably, the Golden Eagle appears on Mexico’s flag). As a last minute treat as we wound our day down, Camille and I went with trip leader Margaret England one last time to find a reported Tropical Kingbird, and met with success! It was a wonderful excursion with over 60 species identified. It was a good adventure, and it added a couple of counties to my Florida birding lists (Hendry and Glades). Closer to home, there have been a few weather systems bringing moderate fall-outs here and there, and I was lucky enough to catch some migrant action at Turkey Creek Sanctuary over the last couple of weeks. I’m happy with this distant shot of a Rose-breasted Grosbeak – my first ever taken in the Sanctuary. Upon arriving at Turkey Creek on one of the days, I bumped into Bill Haddad and we stuck together for a good chunk of the morning. It was among the more impressive days at the park in recent memory with a good variety of warblers activity, including a sizable number of Prairie and Black-and-White Warblers. 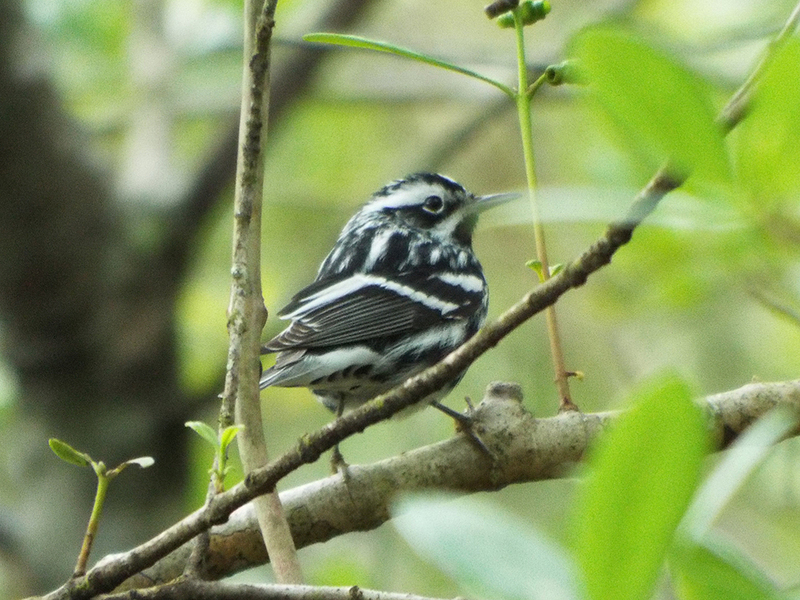 I had to dodge raindrops and foliage to get this shot of one of a couple of dozen Black-and-White Warblers. 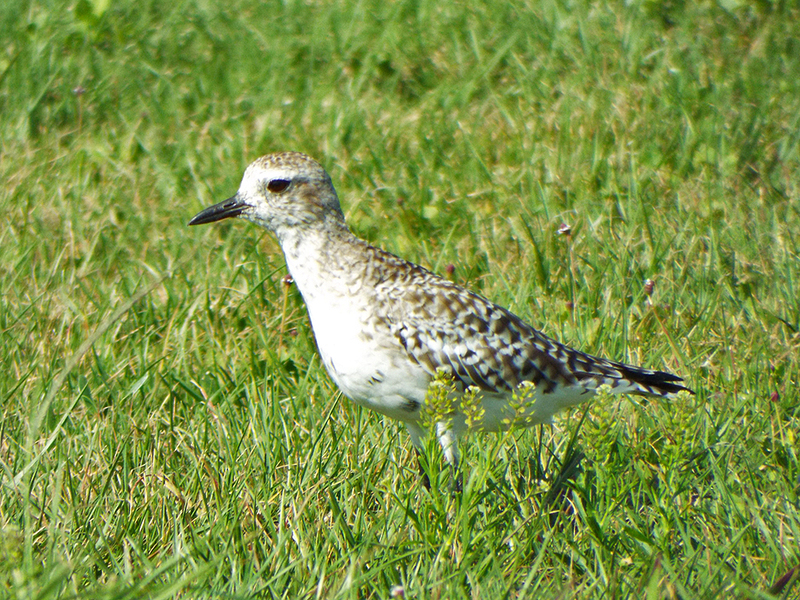 This species is a winter resident, but many move through the state during migration. As the winter resident Blue-headed Vireos depart, the Red-eyed Vireos are heading through on their way north as well (White-eyed Vireos are year-round residents here). 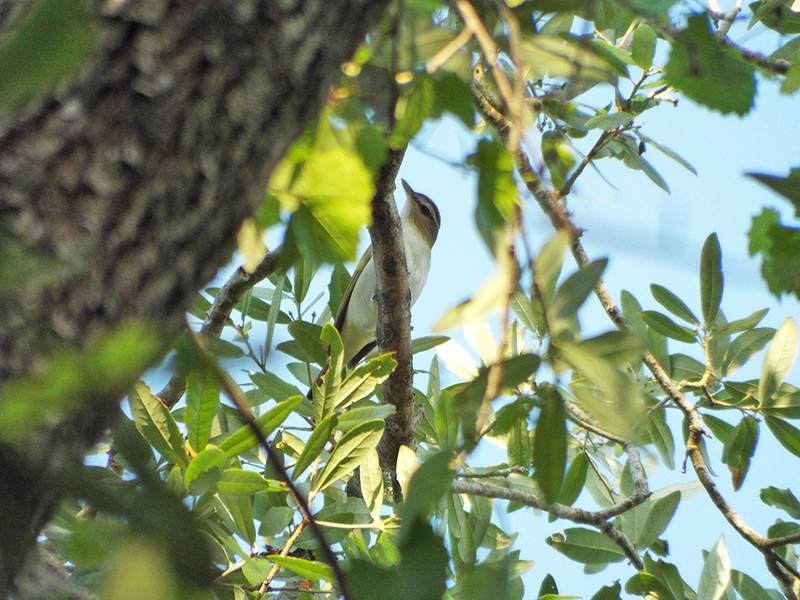 A Red-eyed Vireo playing “peekaboo”, high in the canopy. I heard this bird singing long before I saw it. During a rain shower on one of the mornings, I finally managed to get a photograph I’ve been trying to get for a long time: a Blue-gray Gnatcatcher singing! Their song is so soft and easily overlooked that it took me years to even recognize it for what it was. 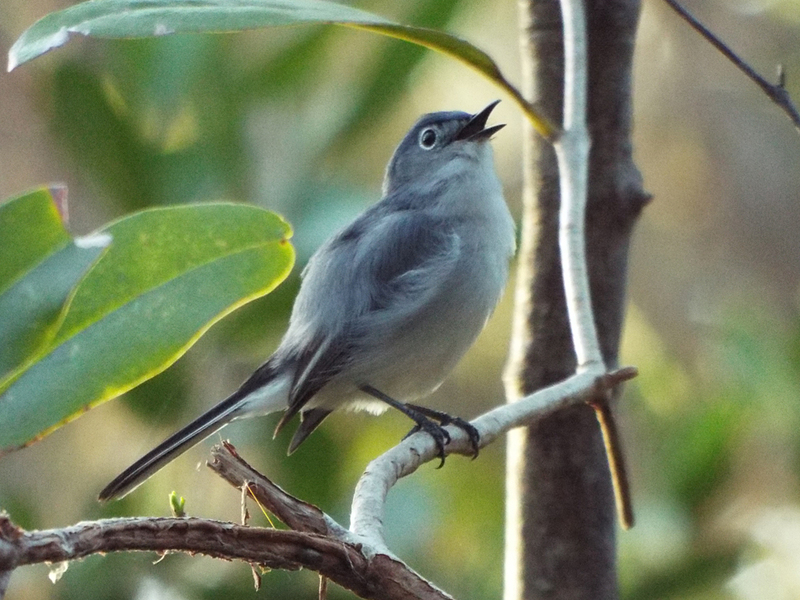 Blue-gray Gnatcatchers are nominally resident all year, but their activity ramps up (along with most birds) as spring heats up and the mating and nesting seasons begin. April 11th was the best migrant day at Turkey Creek in some time, with over sixteen warbler species recorded, some in large numbers. I had my first-of-year Black-throated Green, Bay-breasted and Magnolia Warblers, as well as rare Canada Warblers and a Summer Tanager! Coming next, a few photos from a day-trip to Fort De Soto Park! It has been a tough winter and spring, but I wanted to let you all know that I’m easing back into the blog as best I can. As many of you know, I had some technology failure that resulted in my need for a new PC and some difficulty in blogging. Then, the week before Easter, my father passed away after a long battle with heart disease and Parkinson’s. It’s been tough to get my mojo back, but after reasonably fruitful day-trips to Stormwater Treatment Area 5/6 and Fort De Soto Park the past two weekends, I feel I may have turned a corner. So stay tuned later this week for a few photos and such. 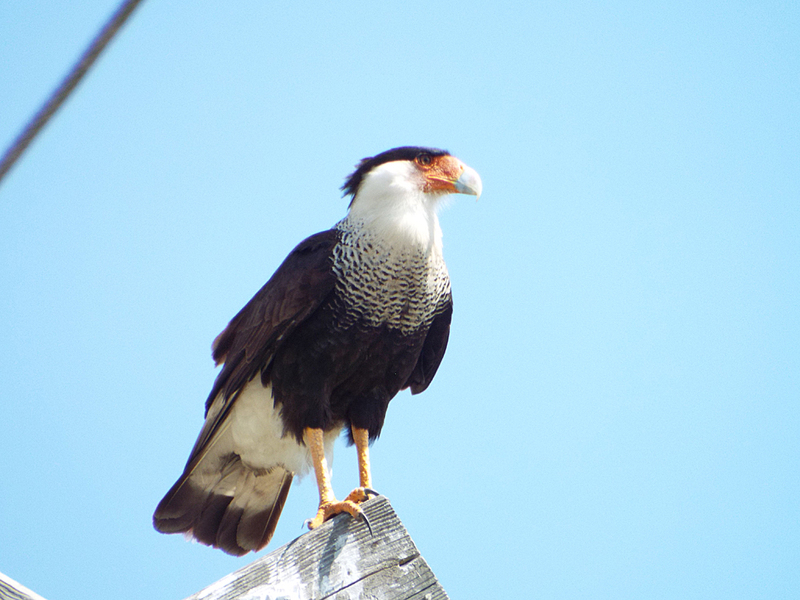 A majestic Crested Caracara in Hendry County seems like a good herald for restarting the blog, yeah? The Space Coast Birding and Wildlife Festival is now past over a week and a half, and as its memory fades, I will try to get some more thoughts and photos down. My first official field trip was the Mitchell Harris-led Shiloh’s Sharptails, Marsh Birds and More. For as long as I’ve been bird watching, I still struggle with sparrow identification, so any opportunity to find them with as an accomplished birder as Mitchell Harris, has got to be taken! 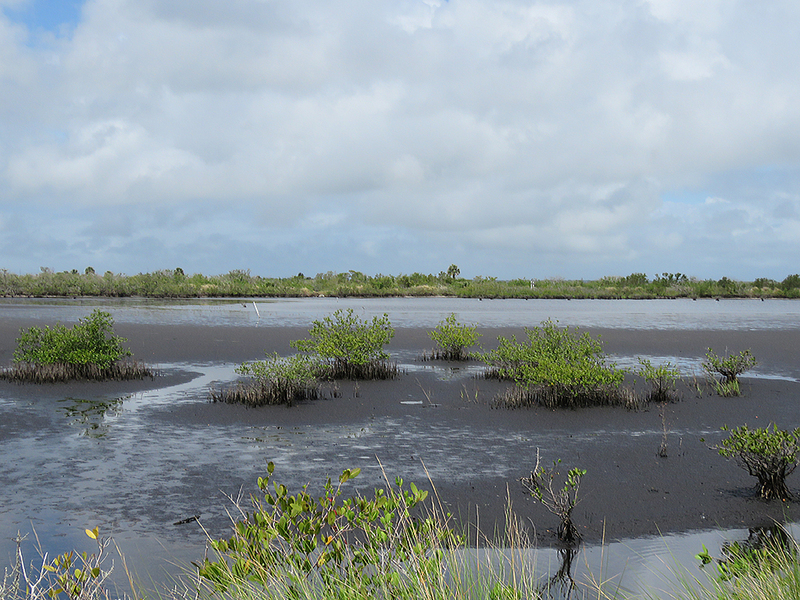 We started our hike through the Shiloh Marsh, a salt marsh area that marks the northern end of the Indian River Lagoon and the border between Brevard and Volusia Counties. As with most festival trips these days, I was birding with my friend Camille. In was also joined with my friends Sarah and Bella for their first festival trip. We set out through the salt marsh before dawn, so I left my camera in the vehicle. The going through the tangle of dead marsh grass and other vegetation made it a tough slog out to where we were most likely to see either Nelson’s Sparrows or Saltmarsh Sparrows. Hurricane Irene’s effects killed back a large amount of the vegetation, so we had to hike out quite a distance to suitable habitat. But it was worth it. After scaring up some Marsh and Sedge Wrens, we finally managed to get at least one Nelson’s and a few Saltmarsh Sparrows to quickly pop up and look around before dashing back in the thick grasses. It was a breezy morning, so the birds were reluctant to stay out in the open for long, but most of us got at least a few decent looks at these birds. We then hiked back to the dike road that separates the marsh from the lagoon, and walked another several miles, as the wind picked up but the sun warmed things up. Looking out over Shiloh Marsh toward the lagoon side of Canaveral National Seashore. 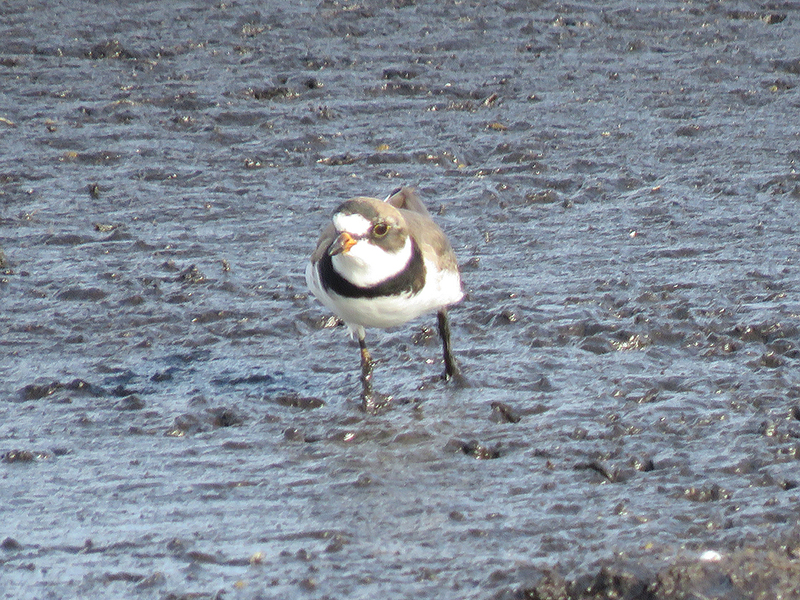 At first the birding was a little slow – the wind was really keeping the marsh birds out of the open. Eventually some shorebirds were seen feeding down on the leeward (downwind) sides of the dike road, including both Greater and Lesser Yellowlegs. The larger, middle three birds are Greater Yellowlegs, the small bird on the right is a Lesser Yellowlegs. Besides the size difference (not always evident if both species aren’t near each other), see the difference in bill length in proportion to the head. 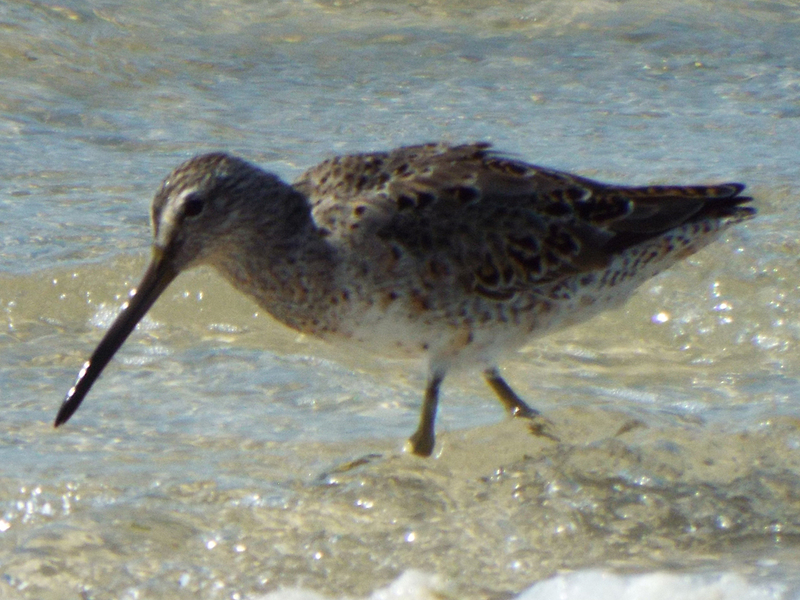 The Greater Yellowlegs’ bills also look slightly upturned. 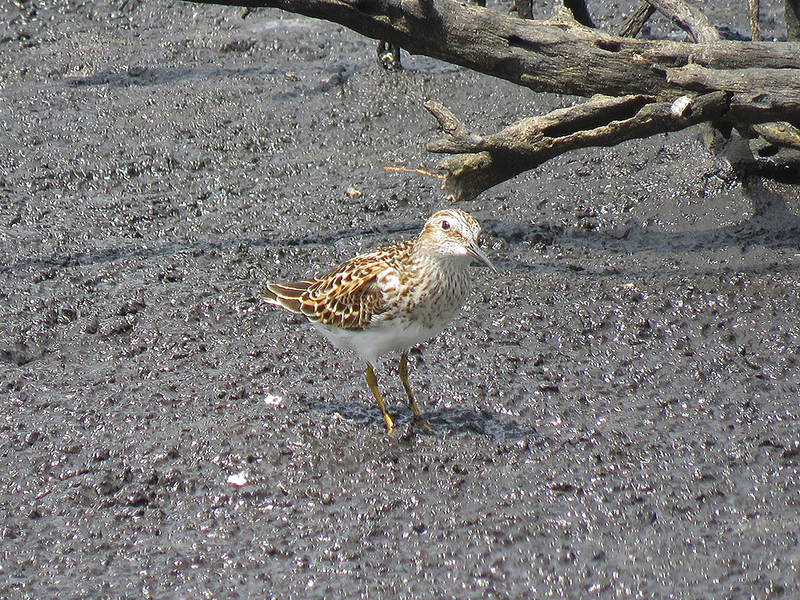 We also managed to see some Least Sandpipers and a Long-billed Dowitcher along the same stretch of mud and sand. Eventually, as we hiked the dike road back, more waders started congregating in the marsh, including some very color-saturated Roseate Spoonbills. 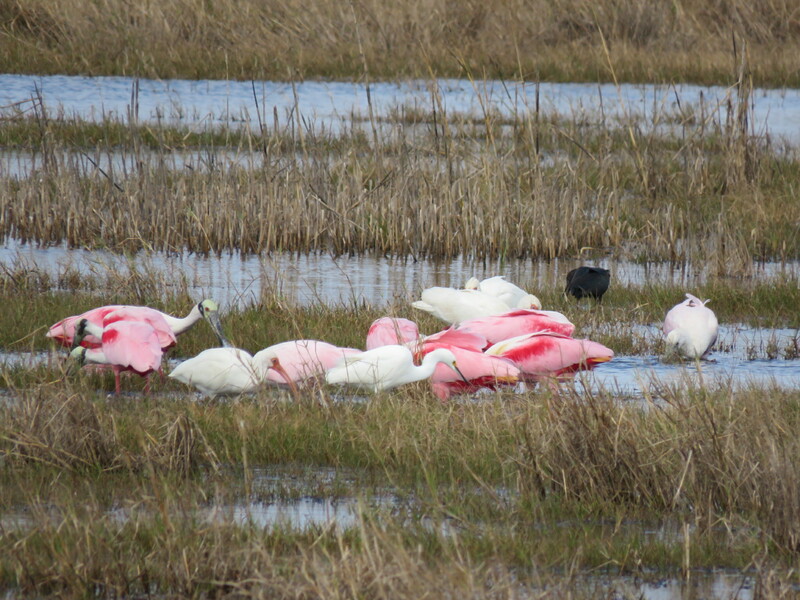 A congregation of “typical” waders: Roseate Spoonbills, Snowy Egrets, and White and Glossy Ibises. 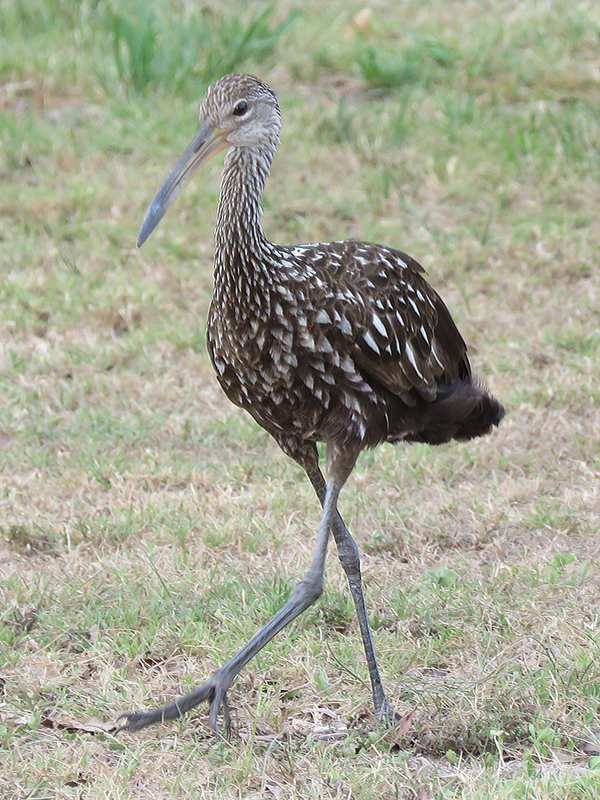 After living in Florida for 15 years, it’s easy to forget how exotic these species are to out of state visitors, especially from more northern climes. After finally making it back to the vehicle (Mitchell and most of the other birders had gone ahead to get to scheduled workshops and other events), we headed over to Festival HQ at Eastern Florida State College, in Titusville [map]. 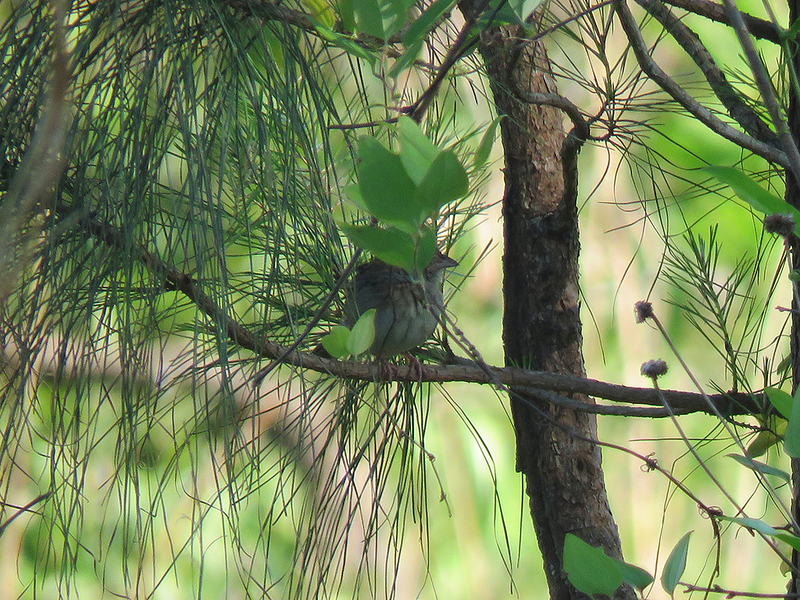 When all was said and done for the Shiloh Sparrows trip, we got about 65 species, including a couple of lifers! After some classroom presentations, including a surprisingly informative talk on photography while birding, the four of us (me, Camille, Sarah, and Bella) met up and headed over to Chain of Lakes Park, just behind the EFSC campus. We saw a decent array of species, including a nesting Great Horned Owl on an Osprey platform. An owl raised chicks there last year as well, so this may be the same owl. 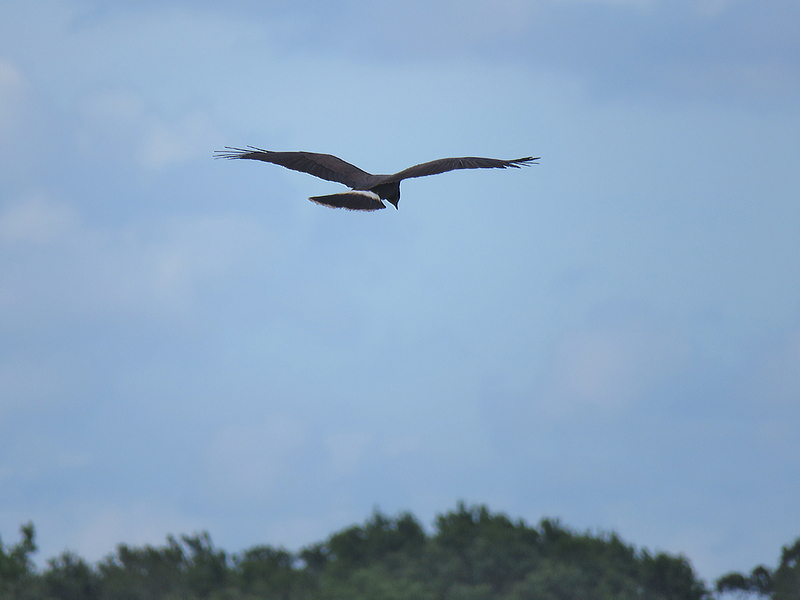 It peered over the edge of the nest at us a few times. The ponds in the park had a smattering of ducks, including Lesser and Greater Scaups, and a rather large assemblage of Fish Crows. One female Painted Bunting added a little more variety to our hike as we wound down to get home for the evening. Here are our eBird lists for the day. A successful if tiring day, but that’s the way it is on SCBWF days!